Today we are releasing a brand new taxonomy designed specifically for businesses that also have fleet management needs: The WAND Fleet Management Taxonomy. When you think of "Fleets" all kinds of vehicles come to mind. Usually, the first thing that's thought of is a long-haul fleet or a fleet of delivery vehicles. But there are so many other vehicles that need to be managed in a fleet. For instance, a construction company also manages their fleet of heavy equipment. Backhoes can be as important as the truck that takes them from site to site. So are aerial work platforms or bulldozers. This taxonomy provides for those terms, much and more. 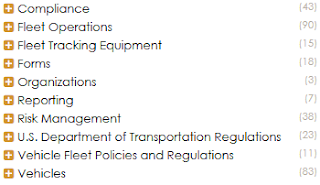 In this taxonomy of 341 categories and 179 synonyms are terms relating to all areas of Fleet Management including Vehicles and Heavy Equipment, Fleet Operations, Fleet Tracking Equipment, Reporting, Risk Management, Compliance, Vehicle Fleet Policies and Regulations, and U.S. Department of Transportation Regulations. 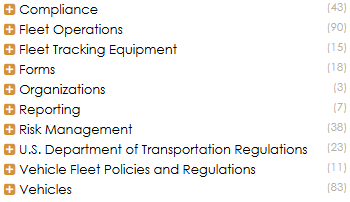 The WAND Fleet Management Taxonomy provides a strong foundation of terms and can be customized to include additional terms related to a specific type of Fleet. As with all WAND Taxonomies, the WAND Fleet Management Taxonomy is available by itself or as part of the WAND Taxonomy Library Portal.